Six panels finished and the seventh almost done. This is a project that has to be finished within the next three weeks or so. I can't tell you how fed up I am of staring at the same colour all the time, especially when I am losing valuable gardening time. Serves me right for setting myself the task. Here goes for Week 132.. 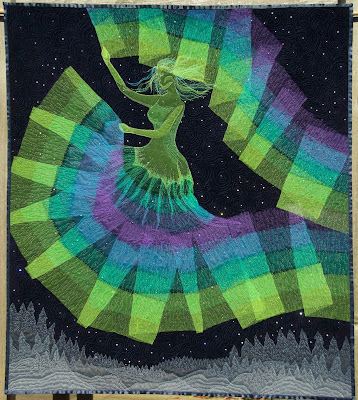 The project that caught my eye in Week 131 was Olena's dancing goddess in the colours of the aurora borealis. If you haven't seen her blog post yet, nip over now and have a closer look. Usually horses are more relaxed when feeding. This must be a highly strung thoroughbred to be kicking back in this way. Perhaps the St. Pancras Ironworks wanted to attract only the wealthiest customers. Over the past month or so it has been really difficult to take photographs because the sky is almost always cloudy. For some reason my camera can't cope with silk, but this week I have finally managed to take some decent pictures. I thought I was never going to get accurate colours, but these photos are fairly true to life. This cushion cover is made up of practice pieces, my first ventures into free motion quilting on silk. Not only did I have to find a way to actually grip the work - rubber thimbles did the trick - but I also had to experiment with thread colours, see how well seams went together and try out buttonholes. I think I struck lucky when I went shopping for buttons. If this cushion stayed in this house it would end up with tea spilt on it and being generally sat on. It is being put aside as a present for somebody who is sensible. Here goes for Week 131.. 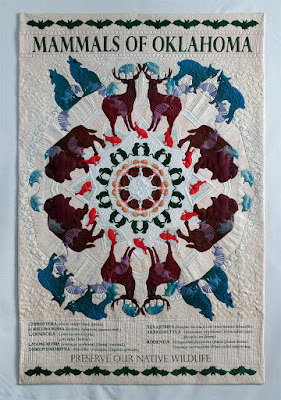 The project that caught my eye in Week 130 was Yanicka's apocalyptic wall hanging. If you haven't seen her blog post yet, nip over now and have a closer look. If only I had thought of this years ago I might have been more adventurous in my choice of fabrics when dressmaking. This is a dupion silk skirt in its early stages. I know from nerve-wracking experience that silk will fray as soon as you have cut it, and I didn't want to lose great chunks of the seam allowance every time I breathed in its general direction. 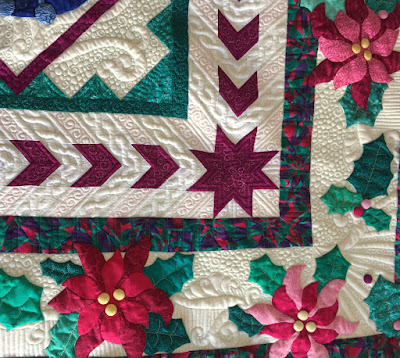 The solution was to lay, rather than pin, the pattern onto the fabric, and then draw the outline of the pattern with tailor's chalk. I used a ruler and a tailor's curves to keep the lines neat. Then I cut a little over half an inch beyond the chalk line and ironed on a strip of fusible interfacing. I put the inner edge of the interfacing directly alongside the chalk line. ...and the tops of darts. The inevitable fraying will be stopped short once it reaches the interfacing, so I can now get on and sew the darts and insert the zip at my leisure. When the time comes to sew the side seams, waistband and hem, then I shall cut along the chalk lines immediately before sewing. Suddenly the whole project has become a lot less stressy. Crystals arranged in lines, following the saw marks on top of a gate post. This picture was taken in December, when we had two or three days of frost. A little bit of excitement in an otherwise dull, dreary, monotonous, grey, wet and muddy winter. The last time we had a decent snow fall was in January 2010. I am still working on the silk panels, and have nearly finished the fifth one. After that I will just have two left to do before I start putting the project together. Working with silk is turning out to be a bit of a dream. There are no struggles with the weight and bulk of the work. The only slight problem I have had this week has been with the machine, but a bit of extra oil was all it needed. The unsightly tissue on the right was wrapped round the needlebar and presser bar overnight just in case any oil seeped down to the foot overnight and onto the work. Apart from inadvertently letting the backing come into contact with the treadle belt on one occasion, leaving a small brownish scuff, I have managed to keep the work nice and clean. Shannon does it again! The project that caught my eye in Week 129 was her amazing mammals of Oklahoma quilt . If you haven't seen her blog post yet, nip over now and have a closer look. Regularly maintained machines can still give you a nasty surprise. Before starting my latest project I thoroughly oiled my Singer 15K treadle, taking particular care to oil all the accessible points revealed when the rear inspection plate is moved. I also made sure that I oiled the felt oil reservoirs at the top of the needlebar and presser bar and the ones that are reached through the holes next to the spool pin. These two previous posts show my 15K hand machine, which has exactly the same innards. The mechanism was in a different position, which explains why the photos seem so different. So I have been quilting happily over the last couple of weeks, and everything seemed fine until last night. Suddenly the machine started labouring, sounding as though it hadn't been used for aeons and I had just brought it home from a second hand shop. A good half hour was spent checking the machine to find which particular spot needed oiling. It was a real puzzle, because there was still plenty of oil in evidence from the last time. Eventually I realised that the noise was coming from the U-shaped junction on the left in the photo above, where a shaft that goes down the pillar to the base of the machine joins the horizontal rod that is turned by the wheel. In theory the oil reservoir should keep this joint well lubricated. The right side of the joint was fine. However, to the left, where indicated by the knitting needle, it was bone dry, as if it had completely missed the last oiling. Needless to say, I have slathered the machine in oil, and it is running like a train again. Why did it dry out so quickly? I'm not sure. Either I have been using the machine more than usual (I didn't think I was); or, the oil reservoir no longer wicks as it should; or, perhaps because of the U-shape and the position of the needle when the machine is not in use, the oil has a tendency to drain away. Who knows? Who cares? The problem is fixed, and I know what to look out for in the future. This week I have been busy with silk again. 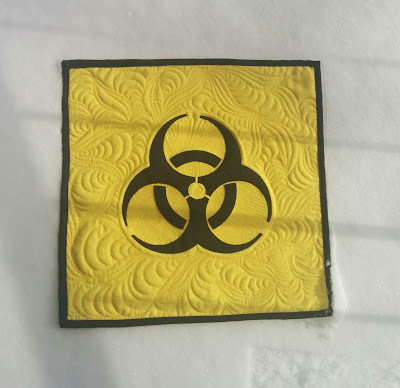 I have come up with a project that needs seven quilted panels. So far I have completed three. The silk I am using is a shot dupion. The red warp threads show when the fabric is held at an angle, but the main colour is blue. On this photo I have managed to capture the colours reasonably accurately. And on this one the camera panicked and got the blue all wrong. I have been quilting leaves and berries in a variegated thread in dark blues. This is the thread that works best on this silk. When experimenting last week I tried three different shades of thread. I thought that a thread that included shades of dark red would go well with the red element in the silk. However it actually seemed to deaden the shot effect, so I have stuck with a low contrast thread. The project that caught my eye in Week 128 was Shannon's confession quilt. If you haven't seen her blog post yet, nip over now and have a closer look. Singer books, especially if they predate World War 2, are an endless source of fascination for me, and this one is the most intriguing. Projects range from the sublime to the ridiculous and all appear equally impossible. ...and this gal is on page 3, busy on her Singer 15 treadle. Page 6 shows her looking fearfully modern, using a model 15 that has been fitted with an outboard motor. Some time ago I bought this cutwork runner in a charity shop. I knew that, in theory, I could make this sort of stuff on the treadle. The trouble is that I read the instructions in the book and end up baffled. This, supposedly, is for beginners and is Lesson 3. Once you get to Lesson 5 you are ready to cast out into the void and stitch bars across cutwork. The very notion was all too much. And then, the other day, while frittering away my time on YouTube, I chanced upon this. Somewhere in Italy Maria Antonia is blazing away on her granny's treadle and showing how it's done. Unlike the cloth, the video is uncut, so she gives you plenty of chat to listen to. My understanding of Italian is pretty rudimentary, but not understanding her fully doesn't really matter because the video is so clear. One thing I am sure of though is that she doesn't tell you how to prevent your pearls getting snagged on the tension discs. One of the most boring photos I have ever taken, yet strangely fascinating.